Vouliwatch is a digital platform that engages Greek citizens with legislative politics and grants them with the opportunity to communicate, evaluate and hold elected representatives in the Greek and the European Parliament (MPs & MEPs) accountable. Similar successful initiatives (“Parliamentwatch”) in countries like Ireland, Luxemburg, Tunisia, Germany, France and Austria have been sources of inspiration for our team as well. Vouliwatch is an independent, non-profit initiative aiming to promote public dialogue, knowledge, political participation and accountability between citizens and politicians. Their goal, having as sources of inspiration similar initiatives in Ireland, Luxemburg, Tunisia, Germany, France and Austria was to create a platform that engages Greek citizens with legislative politics and grants them with the opportunity to communicate, evaluate and hold elected representatives in the Greek and the European Parliament (MPs & MEPs) accountable. Public questioning (“Ask your MP/MEP”): In a moderated platform, citizens can publicly ask questions and receive public replies by MP’s and MEP’s. To prevent misuse of the platform, all citizen questions and politicians’ answers are crosschecked according to a published code of conduct that is aligned with the principles of open government ethics. Votewatch: This application allows users to keep an eye on the voting behaviour of each MP while informing the public on the details and background information of each legislation put forward for voting. “Crowdsourcing legislation” and parliamentary control (“Share ideas, experiences and make proposals”): Citizens can publicize their experiences, ideas or proposals either at the national or at the local level. The community of users can comment and rate them. A Google map application depicts all submitted data with the option of filtering based on different criteria (location, subject categories such as e.g. education, tourism, etc.). Every month all submitted data is summarized in a report and sent to all MPs and MEPs by our team, as food for thought and action. In case relevant parliamentary action is taken by MP’s/MEP’s due to a citizen request or a public claim, Vouliwatch publishes and promotes reactions. “Policy Monitor” (“compare party positions”): The Policy Monitor is a digital tool which allows our users to learn about and compare what the main political parties positions are on given issues. It also gives them the opportunity to comment on these positions and suggest to political parties different approaches. 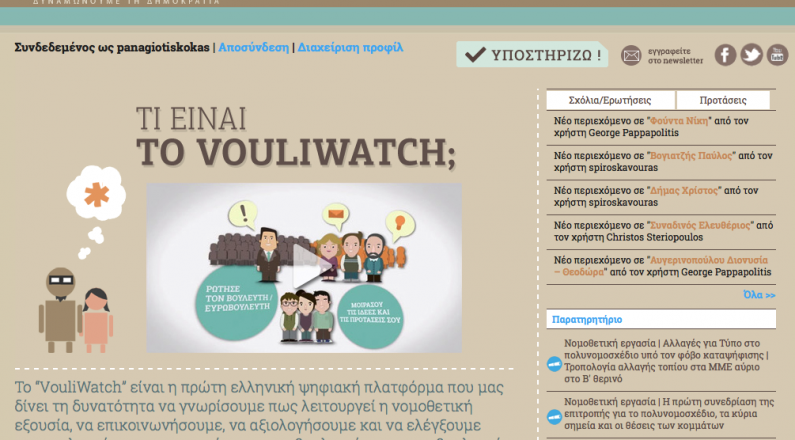 Vouliwatch.gr is based on Q-Engine specially customized for Political crowdsourcing initiatives. Q engine is a technology framework developed by Crowdpolicy, that uses crowdsourcing processes and techniques through a multi-channel pattern of evaluation monitoring.